Tomorrow he starts working shifts on the leader desk at The Guardian, which he plans to do for the remainder of his notice period. He also has a documentary planned with the BBC and will continue to do his regular slot on BBC Radio 4’s Thought for the Day. 19/12/11 Start The Week with guest Giles Fraser. 23/12/11 Thought For The Day with Giles Fraser. 24/12/11 Saturday Review with guest Giles Fraser. 1/1/12 Sunday with guest Giles Fraser. 5/1/12 Newsnight with guest Giles Fraser. During his recent appearance on Newsnight one of the programme’s producers – Sara Afshar – tweeted “Giles Fraser is great” and “I actually cheered at one point“. With his adoring lefty fans at the Guardian/BBC, one thing the Reverend Dr need never worry about is being unemployed. Wonder if you share my..ahem..surprise…that Allegra Stratton, the former political correspondent at the Guardian, has been appointed political editor of the BBC’s Newsnight programme. BBC..Guardian..BBC. Let me quote Orwell..
and compare these two final words from each article….just how similar are they? 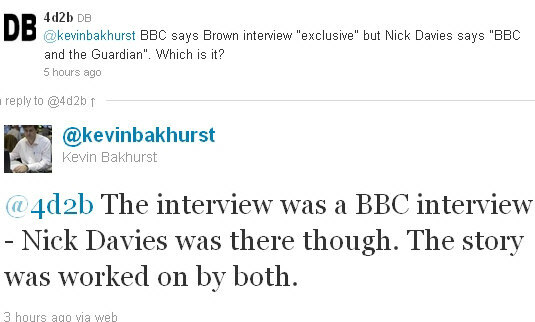 As we frequently observe here, the BBC is simply the broadcasting arm of the Guardian. The only difference is we are FORCED to pay for one. Fishing around for a “safety in numbers” line of attack, perhaps? Hope that clears things up. No? 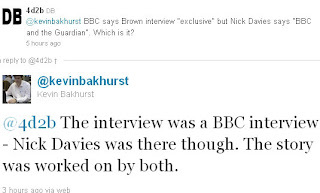 Well, for the time being perhaps it’s best we all just assume that the BBC and the Guardian are one entity. Most newspapers are trying to come up with new angles on the phone hacking scandal but it seems one in particular is getting some extra help from the state broadcaster. Yesterday afternoon (at 17.14 according to the time stamp) the Guardian posted audio of a phone conversation in which Barry Beardall, a scam merchant working for the Sunday Times, tricked someone at the solicitors Allen and Overy into giving up information about the sale of Gordon Brown’s flat. @amonck And you think the Gdn would just back down over that? Or share editorial decisions? Also no mention of Sun Times defence on Beeb! @DRoseTimes Depends who scored the audio. Besides reporting was v weak + Beeb led on royal angle..
Once the BBC had broadcast the audio as an exclusive, the Guardian was free to re-post it on its own website. The licence-funded BBC joining forces with the loss-making left-wing Guardian to attack Murdoch. Agenda? Perish the thought. Gordon Brown has alleged News International used “known criminals” to get access to personal information when Labour was in power, in an exclusive interview with the BBC. A double whammy from Evan Davis on the first paper review of this morning’s Today programme. Not only did he treat us to the paper review catchphrase (“The Guardian leads with the same story as us”) he went on to tell us that the Telegraph’s main headline (about the IMF) was “slanted”. Thanks for the editorialising, Evan, but how about letting us make up our own minds? What was it that former BBC journalist Peter Sissons said again? By far the most popular and widely read newspapers at the BBC are The Guardian and The Independent. Producers refer to them routinely for the line to take on running stories, and for inspiration on which items to cover. In the later stages of my career, I lost count of the number of times I asked a producer for a brief on a story, only to be handed a copy of The Guardian and told ‘it’s all in there’. Perhaps the Guardian has such low circulation figures because the lefties choose to listen to the broadcast version on Radio 4 every morning instead. Yesterday the Guardian splashed with the story that David Willetts was considering proposals to allow the wealthy to pay their way onto oversubscribed university courses. The BBC, brimming with righteous anger, made the story its lead item in the morning. Today the Telegraph led with a letter from 42 family doctors, the heads of GP consortia representing seven million patients, in which they declare their support for Andrew Lansley’s health reforms. The BBC ignored the story. There was not a word on this story in the news bulletins of our public service broadcaster. Just imagine what would have happened if the 42 had written a letter saying the reforms were all a terrible mistake and simply would not work. The BBC would have trumpeted it from the rooftops; talking heads would have been wheeled into the Today studio; we would have been in full Coalition in Crisis mode. Instead, we’ve had a complete and rather shameful silence. There is something unsettling about the national broadcaster choosing to ignore a major political story because it does not suit its own agenda. Earlier this year we learned that the BBC was helping the Guardian produce its front-page scoops. An interesting series of tweets from yesterday shows that the licence payer is also subsidising technological advice to our national broadcaster’s favourite newspaper. The natural first port of call following a morning’s discussion of election coverage. Great presentation from @brettsr on #fivelive visualisation . He even came over to Guardian Towers to do it! Just grabbed a coffee with @bowbrick in the Guardian canteen. Talking blogs, governors, twitter & the like. Great presentation about BBC 5 Live interactivity from @brettsr – Gdn can only afford a fraction of what they do, but will take inspiration. @MatthewWells Did Guardian pay BBC industry rates for R5L presentation today? Are these licence fee funded presentations available to all newspapers, or just the BBC’s ideological soul mates? We’re in the middle of a mini Obamafest at the moment as the BBC celebrates the first anniversary of The One’s inauguration. To balance the many pro-Obama films and programmes made by adoring fans, the Beeb has commissioned a couple of documentaries about Americans opposed to Obama. Amazingly, this project was given to someone with a sympathetic view of the subject matter. In this two-part documentary, author and journalist Gary Younge tells the story of the other side of the Obama phenomenon; the story of those who say that the Obama presidency is nothing but bad news. Younge asks who these people are who feel they have been marginalised by the Obama revolution. He also asks what they don’t like about him and what Obama could do, if anything, to win them over. Younge spends 10 days travelling through rural Arkansas and Kentucky, talking to anti-tax protesters, fundamentalist Christians and libertarians, country club members and local dignitaries to find out how they view the last year under Obama and what their hopes and fears are for the coming year. Does the BBC provide weeks of journalistic assistance to all newspapers seeking to break major stories or is this licence fee funded service available only to the Guardian? US Secret Service agents have revealed a teenager was behind a Facebook survey asking whether President Barack Obama should be assassinated. The agency says it has spoken to the juvenile and his parents and determined there is no intent to harm the president. This turn of events can’t be unknown to the BBC, and given the evident interest in the story it seems a strange editorial decision not to provide an update explaining that it was just a stupid kid doing a very stupid thing. Why would the BBC not be keen to allay the fears of its readers? Was the bland denouement such a disappointment to BBC journos that not one of them can be bothered reporting on it? But try typing “George Bush” and “die” into Facebook’s search engine. These groups were there while George W Bush was in office. Eight months after he left, they’re still there. The world will endure four more years of idiocy, arrogance and unwarranted bloodshed, with no benevolent deity to watch over and save us. John Wilkes Booth, Lee Harvey Oswald, John Hinckley Jr. — where are you now that we need you? That was Charlie Brooker, Guardian columnist and now, er, BBC TV presenter.